A simple marinade yields juicy, flavorful chops in this Easy Cilantro Lime Pork Chops recipe. Read on for details, or or click here to jump down to the recipe. I originally published this Easy Cilantro Lime Pork chops recipe back in 2010. I came up with this when looking for a very simple meal to make in the hotel suite kitchen where we were staying in Yankton, South Dakota. There was very limited cooking equipment in this hotel kitchen, so I needed to come up with something very uncomplicated. With just a few easy ingredients, this cilantro lime marinade adds a lot of flavor, resulting in a nice juicy pork chop. When I heard today’s Sunday Supper was focusing on easy pork chop recipes, I thought it would be a great time to remake and update our easy cilantro lime pork chops. Glad I did! This is as tasty as it is easy. Plus it got the thumbs up from our discerning son, both when he originally tried it at age four as well as when he wolfed down the remake recently! Speaking of easy pork chop recipes our son loves, if you’re in the mood for grilling your pork chops, you’ve got to try our Heaven Sent Grilled Pork Chops recipe! When I originally made this Easy Cilantro Lime Pork Chops recipe, the chops I had were so thin I cooked the pork entirely on the stove top. This time, the chops were a bit thicker, between 1/2 and 3/4 of an inch. Still “thin” relative to the thick cut I usually buy, but thick enough they needed to get finished with about 5 minutes in the oven. Starting the chops with a quick pan sear creates some nice browning on the outside edges of the meat. 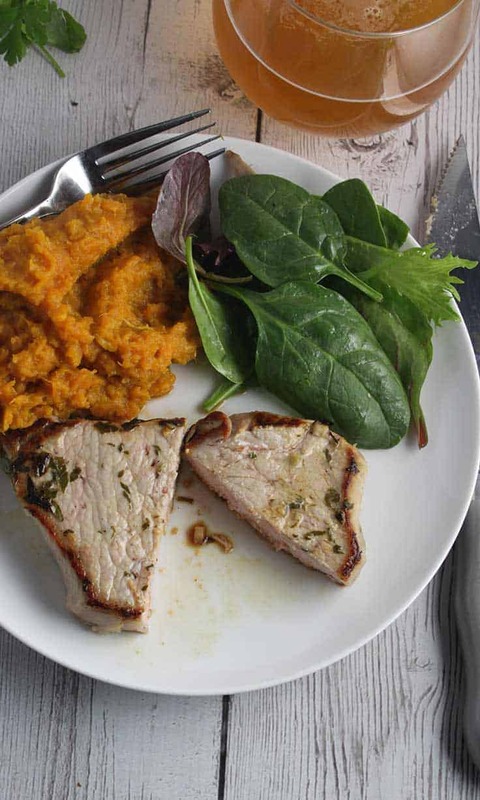 I love to serve Sweet Potatoes with Cumin Sage Butter along with pork dishes, and as expected, it was very good alongside the Easy Cilantro Lime Pork Chops. 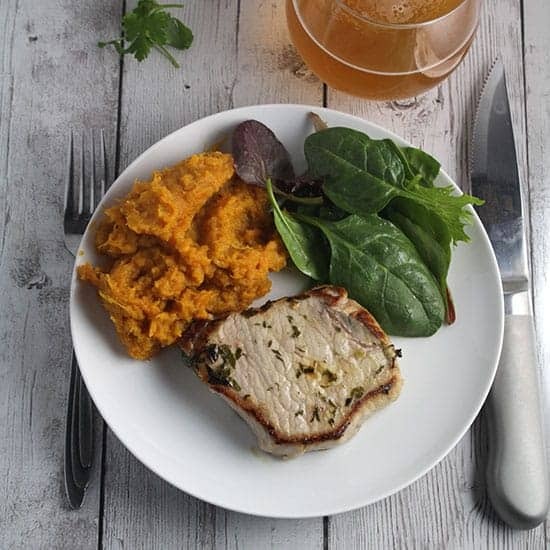 I’m usually inclined to serve our meals with a glass of wine, but I decided to mix it up and pair our pork chops with beer. 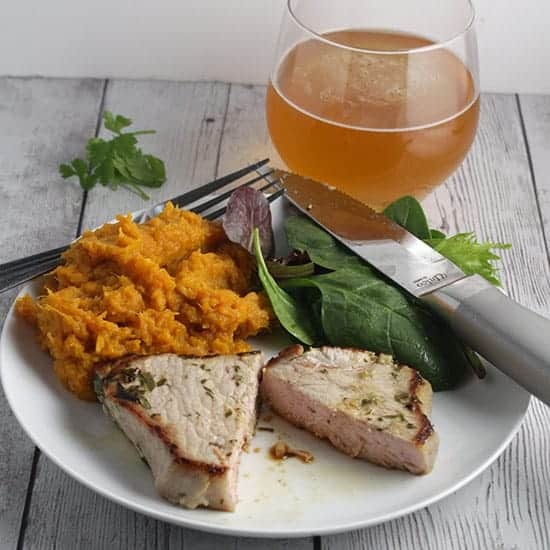 We found a brew that was crisp with a little citrus note to it, and that made for a good pairing with the flavor of the pork chops. If you do want to go for wine with the pork chops, my first inclination would be a Riesling. An easy cilantro lime marinade make for a juicy and flavorful pork chop. Make the marinade: combine the lime juice, cilantro, garlic, salt and olive oil in a small bowl. Place the pork chops in a large plastic bag, pour the marinade into the bag to cover. Close the bag, shake it up to coat the pork. Marinade in the refrigerator for 30 to 60 minutes. Remove pork chops from the fridge 10 minutes prior to cooking. Coat a large, oven proof skillet with oil spray and heat on medium high. Shake the excess marinade from the pork chops, and place the chops in the skillet. Sear the pork chops for 2 minutes, then turn over to sear for another two minute. Move the pork chops to the oven to finish cooking the meat. Roast for about 5 minutes and check for doneness. Cooked pork should be 145 degrees. 5 minutes was just right for us, but return the pork to the oven for a couple more minutes if needed. When the pork is cooked to 145 degrees, let the pork rest for a few minutes before serving. Easy Cilantro Lime Pork Chops by Cooking Chat you are here! AAAhhh David, I thought for sure when you didn’t pair it with wine you were going to go for hard cider LOL. This recipe is perfect….easy peasy and delicious. I especially cannot wait to try that sweet potato recipe. I’m not much of a hard cider person, Wendy. As you know it’s usually wine pairings here, but I’m trying to sprinkle in a bit more beer pairing ideas. They look so juicy and tender!! And love the sear on them before finishing them in the oven. Thanks, we do like a little browning to seal in the flavor. Lime and cilantro is such a flavorful pairing for pork! It’s funny, while I know cilantro lime goes well and I might use them with pork in a stir fry, it wouldn’t jump to mind for chops but sure it’s tasty! thanks, it is a good combo on all kinds of pork! I’m saving your recipe for summer! These marinated chops would be great on the charcoal grill! yes, this would be good on the grill! I’d pair these with beer or wine. Love those flavors!